There is an immense amount of preparation that goes into planning and ultimately attending a trade show. Perhaps one of the most difficult decisions to make can be choosing to either rent a trade show booth or purchase one, based on your firm’s current budget and time constraints. When making these decisions it is important to consider all aspects that go into a successful trade show experience and the time needed for each step in the process. Aside from cost obviously, a firm must also consider logistics, freight/material handling, time constraints, and labor to install and dismantle your booth. All these factors require careful contemplation to ensure that you are creating a sustainable decision that makes sense for your firm’s economic status, so you’re not breaking the bank. Deciding to rent or own can be a daunting task, but we are here to provide some helpful insights for your next trade show experience. Here are 5 scenarios where renting may be a smarter alternative to purchasing for your company. If your company is looking for a cost-effective strategy that caters to budget restraints. Owning a booth comes with some pretty large expenses, the biggest of which are usually shipping and storage fees. Renting a booth means you don’t have to pay to have it stored when you are not using it. Additionally, once the show is over it is not your obligation to ship it back to the exhibit house. Avoiding these expenses can save your firm not only money but time as well. Renting also allows you to avoid the large capital expenses of initially purchasing a booth and the taxes that are incurred with it. If your company plans on attending multiple shows, on a tight budget. Renting a booth allows your company to have a number of booths at different events, even if there is a small amount of time between shows. Say your firm is attending a show in Las Vegas and you have a second show the following week in Orlando, it would be near impossible to get your booth across the country and set up in time for the show open. In this scenario, it would be much easier to have two separate rentals, as opposed to trying to get your single booth to the next show on time. Renting allows you to minimize risk when it comes exhibiting at multiple shows within a narrow time constraint. If your company needs customization when it comes to rebranding. If your company is planning on rebranding itself or is in the process of currently rebranding, your firm should seriously consider renting a trade show booth over purchasing. The nice thing about a rental booth is the ability to add and change graphics on the surface of the booth, but more importantly, rental booths are usually always reconfigurable when it comes to layout. Renting a booth gives you the benefit of seeing what your rebranded booth would look like in a temporary setting until you are ready for a permanent solution. Having the ability to rent tradeshow booths is like having a wardrobe full of nice outfits that are good for multiple occasions, while purchasing is like having one very nice outfit that you use for every occasion. Renting allows for you to give the impression that your company has multiple booths and your booth will look different from show to show. 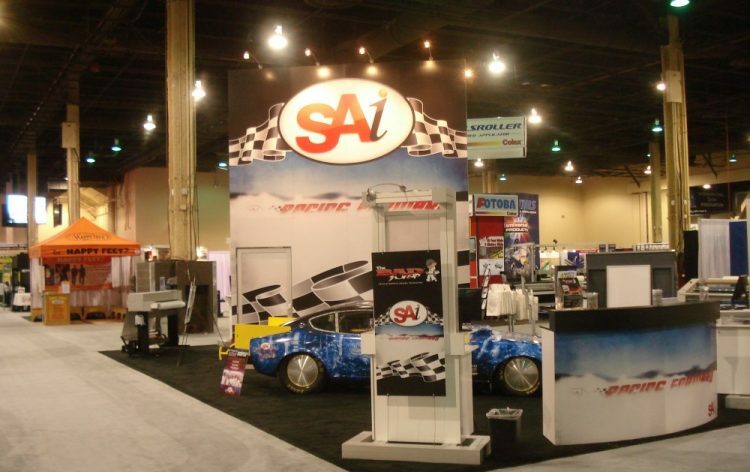 If your firm doesn’t have resources or the time to perform maintenance on your trade show booth. Because you don’t actually own your rental, maintenance, and repair costs are at a minimum. Aside from small on-site repairs, it is not your firm’s obligation to keep up with the longtime maintenance of the booth. There is almost always some form of “wear and tear” that comes back with a both after a show is completed When you own a booth things tend to get damaged over time when shipping from location to location and you can avoid these costs by securing a rental. If your company prefers to have a more environmentally-friendly mindset. When an exhibit house offers rentals to its clients, they are most likely reusing the components of the booth. This means that there is no wasted material that comes along with creating or rebranding an owned tradeshow booth. Additionally, this means that your company is exempt from paying any fees that are associated with recycling or disposing of exhibit components, which means you’re saving money and ultimately time. We hope that this article was able to provide some helpful insights into the world of trade show booth rentals. At Team One we have an experienced team of professionals that will help you make the best possible decision for your firm.